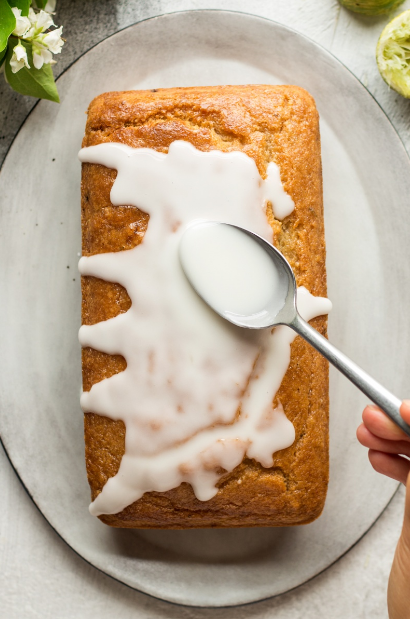 Measure out the plant milk and bring it to room temperature ahead of baking or warm it up to room temperature (do not allow it to get warm as it will melt the sugar in the batter) if you are in a rush. Heat up the oven to 180° C (or 160° C fan forced) / 355° F (320° F fan forced). Line a 1 kg / 2 lb tin with a wide strip of baking paper to be able to remove your cake easily. Whisk the softened (not melted ideally, although melted works too, but the cake will be a little less fluffy) coconut oil and sugar together with an electric whisk. Add in the lime zest, lime juice and room temperature plant milk and mix well with a spatula. Next, add in the desiccated coconut. I ground it up a little in my coffee grinder first, but that’s optional. In a small bowl, mix the flour with the baking powder and baking soda. Finally, place a sieve over the bowl with the wet ingredients and sift through the flour mix until there are no more lumps left. Transfer the batter to the prepared baking tin. Bake for about 45 minutes, until a toothpick comes out clean and the top is nicely browned. Once baked, remove the cake from the tin. Pierce the top with a toothpick in several places to allow the syrup to infuse the cake better. Brush the surface of the hot cake (that’s important as otherwise the syrup will stay on the surface) with syrup several times allowing the syrup to soak into the cake between each go. Once cool, drizzle with icing starting from the middle so that it drips down to the sides creating pretty drizzle marks. Finally, sprinkle with toasted coconut flakes and lime zest. Place the sugar or maple syrup and lime juice in a small pot over a low heat. Bring the contents of the pot to a gentle simmer and cook until the sugar dissolves completely and the syrup thickens a touch. Set aside. Whisk the icing sugar and lime juice in a medium size bowl until fully combined. Add the lime juice gradually to avoid lumps in your icing and to be able to control the consistency of the icing better. 0 Response to "Vegan Coconut Lime Drizzle Cake"